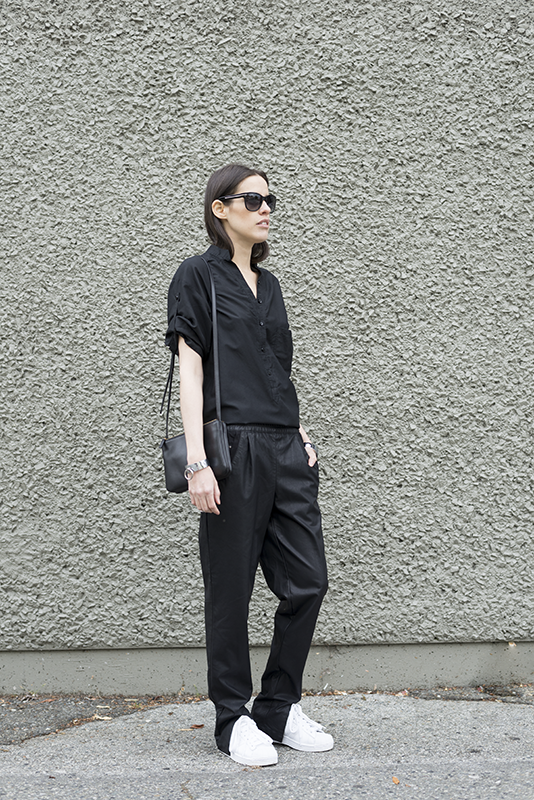 WEARING: JNBY Silk Top, Addison NY Pants, Adidas Superstar II, Celine Trio Bag, Club Monaco Sunnies and THP Shop Cuffs. A relaxed look on the blog today as I have been really busy, in need of comfort clothes and shoes to get me through the days. I seem to be always wearing my Adidas Superstars, let's face it the white sneaker trend is everywhere, from editorials in major fashion magazines to Isabel Marant's latest collection. I can't tell you how glad I am with the sneaker come back in to high fashion, my feet say thank you. As far as my personal designs go, I am super stoked to announce that I have finished all the patterns for my collaboration with the London based brand: Two M Projects. Now time to cut and sew the samples! Nice look, pretty total black with this shoes white, beautiful. Simple, cool outfits are the best. Love the cuffs - in fact, the whole outfit is stellar! I love this look! Super chic! I agree, my feet also thank the fashun world for this new (reamerging) trend. I never really loved it to start off with but once I started living in my Marant pair last year I've moved onto my Cons and that's all I seem to be wearing lately which is cool since I prefer more casual, minimalistic looks these days as opposed to crazing prints. Anyhoo congrats on the collab and good luck with the sewing up! I know it's going to be awesome! I am all about the pants babe. And YES to sneakers. What a cool and chic all black ensemble! You look so chic! I love your style Melissa! total black, love it! and the bracelet is great! This is so cool Melissa! Love it! Good luck with your project! 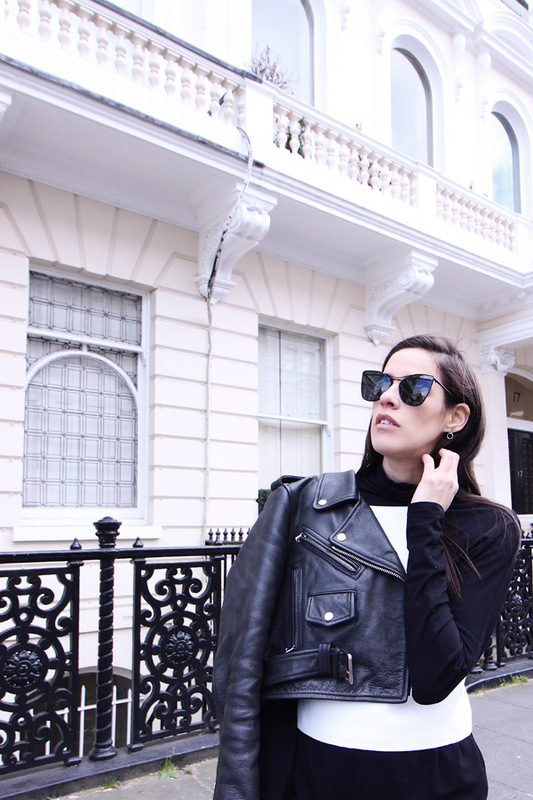 adore the total black ! i like shoes ! This outfit looks so comfortable! I love these pants, they look so suave, I want a pair! Congrats on your achievement hun! Thanks so much for stopping by! Honestly, this has to be one of my favourite posts of this week! 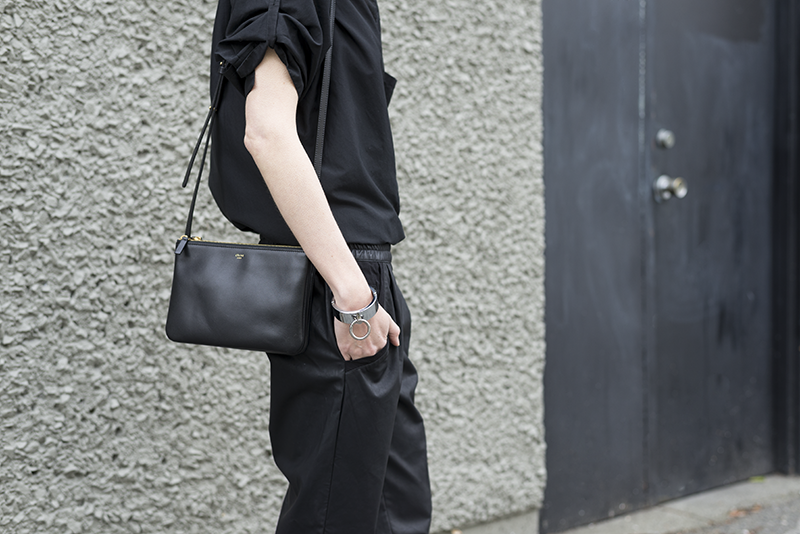 Well done on finishing your work for the collaboration and I love the black Celine Trio bag by the way!